Air Force Diagnostic Imaging Specialists operate equipment to produce diagnostic images and assists radiologist or physician with special procedures. Prepares equipment and patients for diagnostic studies and therapeutic procedures. Performs technical and administrative radiology activities. Ensures health protective measures such as universal precautions and radiation protection measures are established and employed. Assists the radiation oncologist. Manages diagnostic imaging functions and activities. Related DOD Occupational Subgroup: 313. Operates fixed and portable radiographic equipment to produce routine diagnostic medical images. Computes techniques and adjusts control panel settings such as kilovoltage, milliamperage, exposure time, and focal spot size. Positions patient to image desired anatomic structures. Selects image recording media, adjusts table or cassette holder, aligns x-ray tube for correct distance and angle, and restricts radiation beam for maximum patient protection. Exposes and processes images. Uses specialized equipment to perform nuclear medicine, mammography, ultrasound, computerized tomography, and magnetic resonance imaging. Selects imaging protocols and required accessories, and makes adjustments based on the specific examination requirements. Records and processes the image. Manipulates the recorded image using computer applications. Assists physicians with fluoroscopic, interventional, and special examinations. Instructs patients preparing for procedures. Prepares and assists with contrast media administration. Maintains emergency response cart. Assists physician in treating reactions to contrast material. Prepares sterile supplies and equipment. Operates accessory equipment such as automatic pressure injectors, serial film changers, and digital imagers, stereotactic biopsy devices, and vital signs monitoring equipment. Performs image subtraction and manipulation techniques. Assists radiation oncologist in radiation treatment of disease. Operates treatment simulator. Constructs custom blocks and compensating filters. Uses electromagnetic and radioactive source radiations in treating disease. Prepares and positions patients and equipment for, and delivers therapeutic and palliative radiation treatments. Sets and verifies dosage settings on equipment. Monitors patients during treatment activities. Documents patient treatment record. Performs and supervises general diagnostic imaging activities. Mixes film processing solutions, loads and unloads film holders, and reproduces images. Cleans and inspects equipment and performs preventive maintenance. Receives patients, schedules appointments, prepares and processes examination requests and related records, and files images and reports. Enters and maintains data in radiology information systems. Assists with phase II didactic and performance training, evaluation and counseling of students, and maintenance of student academic records. Participates in formal research projects. Establishes and maintains standards, guidelines, and practices. Composes protocols. Prepares routine positioning guides and technique charts. Reviews images to ensure quality standards are met. Performs equipment quality control checks such as processor sensitometry, film-screen contact tests, collimation and light field alignment tests, and safelight fog tests. Monitors personnel to ensure protective procedures such as those in the As Low As Reasonably Achievable (ALARA) radiation safety, hazardous material communications, and Air Force occupational safety and health programs are followed. Performs tests on radiation protection equipment. Assesses staff competence, and monitors the appropriateness of care and completeness of examination requests. Plans, organizes, and supervises diagnostic imaging activities. Analyzes workload and establishes production controls and performance standards for administrative and technical activities. Coordinates on interdepartmental issues that interface with diagnostic imaging. Prepares and implements a financial plan, and monitors and analyzes annual expenditures. Prepares equipment purchase requests and justifications. Monitors equipment performance and preventive maintenance activities. Recommends new equipment procurement. 4R0X1/X1X: Human anatomy and physiology; medical terminology and ethics; legal aspects of medicine; healthcare accreditation standards; radiation physics, biology, and protection; basic electronics theory; techniques of operating x-ray and specialized diagnostic imaging equipment; radiographic positioning; patient care and monitoring techniques; image recording media and processing techniques; sensitometric and quality control procedures; aseptic and sterile techniques; reactions to contrast media; cardiopulmonary resuscitation; methods of recording the fluoroscopic image; budget preparation and execution; and medical records administration. 4R0X1A: Algebra, nuclear physics, clinical chemistry, nuclear pharmacology, and Nuclear Regulatory Commission regulations concerning the use of radionuclides. 4R0X1B: Ultrasound physics; techniques of operating specialized ultrasound components and equipment; advanced knowledge of vascular and abdominal anatomy (topical and cross-sectional), including normal variant anatomy, abnormal anatomy, and obstetric and fetal anatomy; and transducer characteristics, differences, and use. 4R0X1C: Magnetism, magnetic safety, radio frequency, and magnetic physics; techniques of operating MRI equipment; and advanced knowledge of cross-sectional anatomy applicable to MRI. Education: For entry into this specialty, completion of high school or general education development equivalency with successful completion of courses in algebra, and biology or general science are mandatory. Successful completion of high school or collegiate courses in chemistry and physics is desirable. 4R031: Completion of a radiologic phase II course. 4R031A: Completion of the nuclear medicine journeyman phase II course. 4R031B: Completion of a diagnostic ultrasound course. 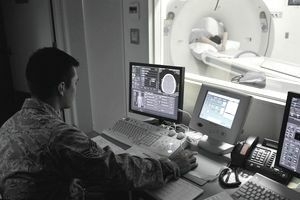 4R031C: Completion of locally determined training in MRI technology, including formal lectures by radiologists or physicists, or civilian courses or seminars. 4R051: Qualification in and possession of AFSC 4R031. Also, experience operating x-ray equipment, and producing and processing radiographs. 4R071: Prior qualification in and possession of AFSC 4R051. Also, experience performing or supervising functions such as producing radiographs, assisting with fluoroscopy and special radiographic procedures, or treating disease by radiotherapy. 4R071A/B/C: Prior qualification in and possession of AFSC 4R051A/B/C respectively. Also, experience performing or supervising nuclear medicine, ultrasound, or MRI functions and activities. 4R090: Prior qualification in and possession of AFSC 4R071, 4R071A, 4R071B, or 4R071C. Also, experience managing radiologic, nuclear medicine, ultrasound, or MRI functions and activities. For entry into this specialty, a minimum age of 18 years. For entry into 4R0X1A/B or C, prior qualification in and possession of AFSC 4R051/71. Required Appitude Score: G-43(Changed to G-44, effective 1 October 2004). What Are the Duties of an Air Force Engineering Specialist?